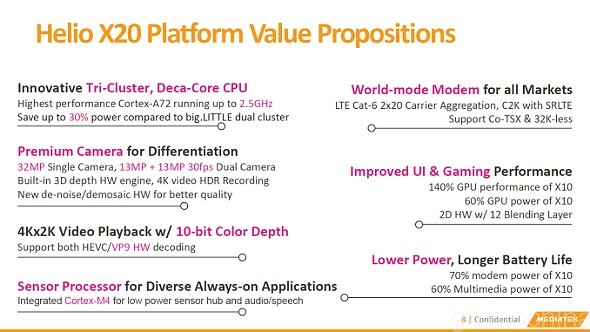 Mediatek's high-end Helio lineup has been widely discussed over the past few months. It is the Chinese chip giant's latest brainchild, intended to take on the Qualcomm Snapdragon 800 series and Samsung's Exynos 7 Octa powerhouses. Mediatek recently started pitching the Helio X20 to phone manufacturer's and OEMs and a lot of that leaked online, so we already have a pretty good idea of what it has to offer and how it stacks up against the Snapdragon 810. A few new presentation slides now showcase the impressive chip in even more detail and paint an intriguing picture of what is essentially a world first on the mobile front in a lot of aspects. First of all, the X20 SoC is based on a unique tri-cluster design and has an unprecedented number of cores - 10. These include four power-efficient Cortex A53 cores, clocked at 1.4GHz, and another four, at 2.0GHz and two high-end A72 cores, with a frequency of 2.5GHz. 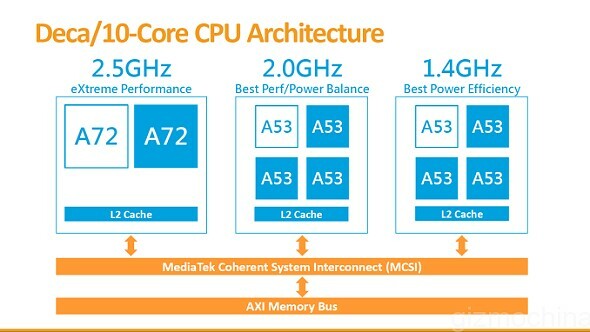 This is all tied together by a custom Interconnect IP called MediaTek Coherent System Interconnect (MCSI). The bundled GPU is equally impressive - a Mali T800, but, like we previously learned, the chip still relies on LPDDR3 RAM, running at 933MHz. 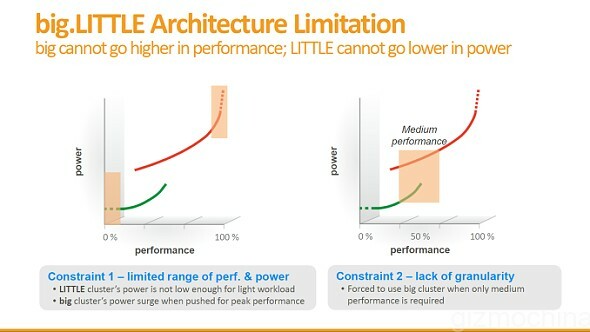 We are curious to see how much the slower memory affects overall performance, but if Mediatek's own assessment can be trusted, we are looking at some serious number-crunching potential. 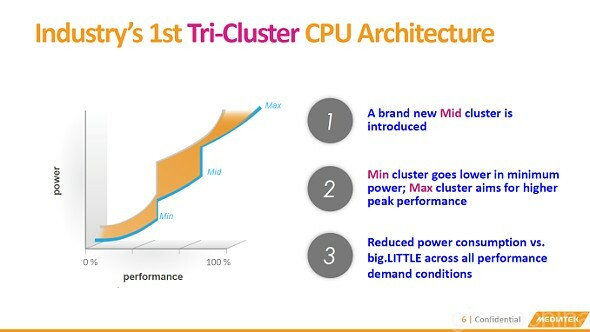 The new tri-cluster design is advertised as not only faster, but also more power-efficient. The manufacturer claims that the Helio X20 consumes 30% less power than the Helio x10 while decoding video and a whopping 40% while encoding it. This all sounds mighty impressive and we can't wait to see the new chip in a future wave of devices. The first smartphones with MediaTek Helio internals should debut in Q2. The latter officially kicks off in April, so we won’t have to wait long to find out what MediaTek has been up to.